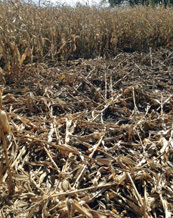 An approximately 35′-diameter corn circle discovered about 10-15 rows into field, by teenagers. 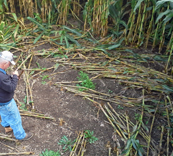 The lay is described as being basically clockwise–particularly around the perimeter–but from photos it is clear the center area has a more “chaotic” lay, typical of many other N.American and Canadian corn circles found late in the season. No info is available about when it may have formed, but we have been told that “3-4 circles per year are found in both corn and soybeans” on this farmer’s land, at least in recent years–none of which have been reported. Unfortunately this farmer is convinced none of these events are “crop circles,” but instead are just “depressions” caused by deer bedding down. Farmer refuses any investigation. While harvesting the same field where the 2013 “Flying Cross” UFO crop circle was found, another new maize circle–this one about 45′ in diameter with a 24′-long, 5′-wide pathway which extended due South–was discovered in the same location as the formation in 2013. EM disturbances have again been occurring on the farm & anomalous light phenomena observed & photographed (see below). Circle had clearly been in the field for 3-4 weeks prior to discovery. A 20 ft. diameter circle (measured both N/S & E/W) was found at harvest. The corn was 13-14 ft. tall & circle was deep into the field. The farmer’s dog refused to go near circle, jumping back into the truck, an unusual behavior for this animal–but the exact behavior it exhibited in 2013 when a maize circle appeared in another corn-field farmed by this same man. The “flying cross-shaped UFO” reported by eye-witnesses prior to the discovery of the 2013 circle was photographed (see 2013 listing) by a witness in a nearby town. In recent years, unusual-looking areas of flattened crop (which are perceived by the farmers as abnormal) are being reported–some quite small and some covering whole fields. 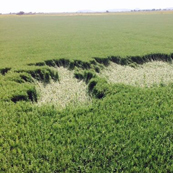 The small patches of oats here were flattened close to the ground and the edges were “racheted” (similar to randomly-downed patches called “Dragon’s Feet” discovered in the UK in the early 1990s in the same areas as the “geometric” crop circles). Recent genuine (non-mechanically-flattened) circles in Holland have had these same “racheted” edges. Brilliant light-ball seen & photographed by Sheffield farmer around 6:00 am as he left house to feed cattle, about 2 weeks before the first of the two 2014 crop circles in his fields were found. 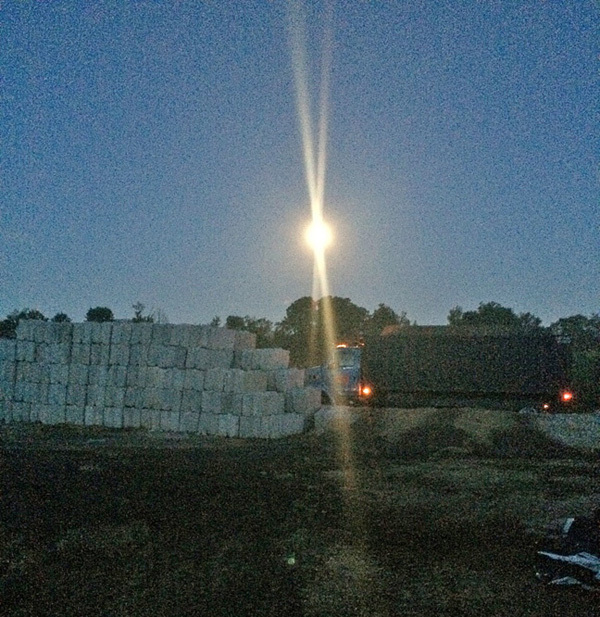 When first seen the farmer thought the light was an “unusually bright & close” moon (which is why he took the photo), but realized later that the actual moon was much higher in the sky, nowhere near as big or as bright, and in another section of the sky altogether. He also states that he felt the BOL was only 4-500 yards away.